Kids never say it’s too cold to ride and with these pants, they’re right. Our warmest kids’ winter riding pants repel frosty gusts and sleet with Polartec® Windpro® that’s fleeced on the inside to keep little seats toasty. The stretchy material frees them to throw a leg over the shaggiest winter beast without restriction and sleek lower leg panels let them pull on boots without having to do a wiggly boot boogie. Dealing with Kerrits has been a wonderful experience. We had a little hiccup but you took care to help me straighten the order out. Painless. I am not sure about these pants because they are on their way to Arizona. But I have previously purchased the same pants and they were received well. That was three months ago and Mom says that they are looking new still with almost daily riding. I was looking for high quality and can I say stylish? A grandmother can do that right? I am very happy with the organization of your company and I am sure that my purchase will be most appreciated. Thanks for all your hard work. I purchased these riding pants for my daughter. She loves them. Pants are warm, comfortable and wash well. She loves the deep phone pocket too! Thank you for your review! We are so happy your daughter loves them! Our daughter loves the pants! 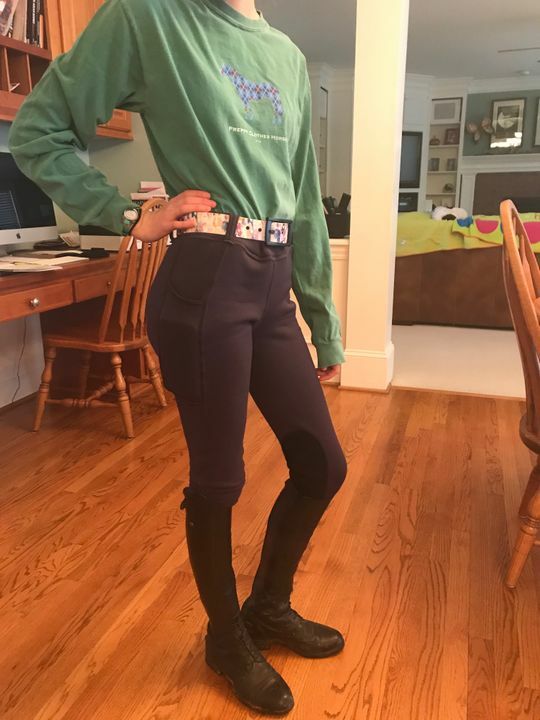 Kerrits breeches are our go to brand for my daughter. They fit her perfectly, no matter the style. She is a very slim girl and we have a hard time finding pants that fit her but these ones are a absolute perfect fit. And the fleece inside is a definite plus for the cold weather!